Tencent Music Entertainment Group (TME) – the largest music streaming company in China and the owner of QQ Music, Kugou, Kuwo and WeSing – has officially filed to float in the US. In an F-1 filing uploaded today to the Securities and Exchange Commission (October 2), TME listed a placeholder registration for $1bn and applied to list on the New York Stock Exchange and NASDAQ Global Market. TME has recently reportedly halved its plan to raise $4bn via a listing in the States, and is now looking to raise $2bn. It has filed to list in the US, predictably, with the ticker TME. 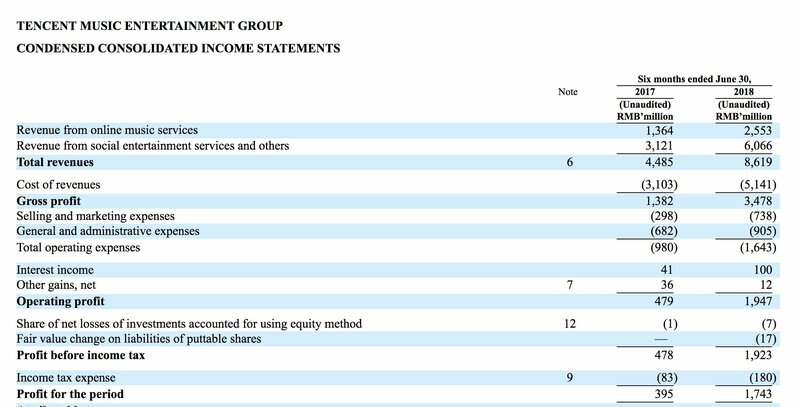 The F-1 reveals some financials about Tencent Music: it shows that in the six months ended June 30 this year, TME’s revenues grew to 8.62bn yuan (US $1.3bn) compared to 4.49bn yuan in the same period of 2017. Gross profit in H1 2018 jumped to 3.48bn yuan ($526m) versus the prior-year period’s 1.38bn yuan – a 151.7% year-on-year rise. Within these figures, TME also breaks down the amount of money it is deriving from digital music (the rest of its revenues are generated from ‘social entertainment services’). The F-1 reveals that TME turned over 2.55bn yuan ($386m) from online music services in H1 2018. That was up 87% on the 1.36bn yuan generated from the same sector in H1 2017. TME’s profit after tax stood at 1.74bn yuan ($263m) in the first half of this year. Tencent owns 58.1% in TME, while Spotify owns 9.1% thanks to a ‘stock swap’ which took place at the close of last year between the two streaming companies.